Update July 2017 ~ We are no longer selling blenny shirts online, but do print them from time to time. Send us a note if you are interested. The Blenny Week t-shirts were a big hit, so we decided to put them online – available to one and all. But Joanne, our design diva, caught Blenny Fever and ran with the idea so we have more, much more. 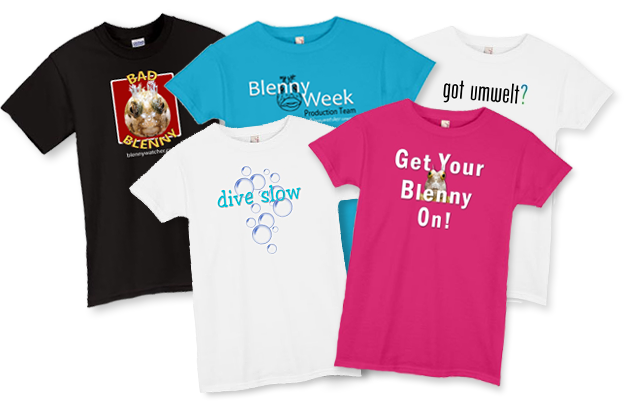 If you have a blenny enthusiast on your holiday gift list (and we’re sure you do) you can make your holiday shopping fun and easy by visiting the Blenny Store for a unique selection of blenny t-shirts. All profits from the Blenny Store are donated to ocean charities so Get Your Blenny On!